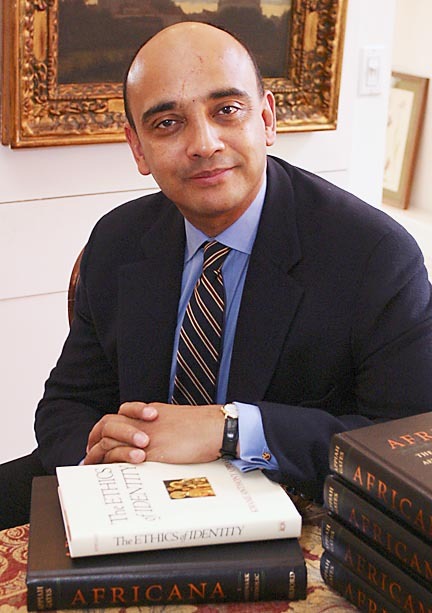 Princeton NJ -- Growing up in Ghana, studying in England and working in the United States, philosopher Kwame Anthony Appiah has shaped a life and a body of work that crisscrosses boundaries and re-imagines the idea of identity. Through an examination of the notions revolving around individuality and universality, he asks us to reconsider what it means to make a life of our own while being responsive to the needs of others. The Laurance S. Rockefeller University Professor of Philosophy and the University Center for Human Values, Appiah is an internationally renowned scholar of moral and political philosophy, African and African-American studies, and issues of personal and political identity, multiculturalism and nationalism. His importance as a thinker is evident in the attention his work garners  for example, he was named one of 25 great “public philosophers” in the world today in the Dec. 29, 2004, issue of the French news magazine Le Nouvel Observateur. Appiah’s writings include numerous scholarly books, essays and articles along with reviews, short fiction, three novels, poetry and an annotated collection of proverbs from Ashanti, Ghana, on which he collaborated with his mother. He is the author of the award-winning “Color Conscious: The Political Morality of Race” (with Amy Gutmann) and “In My Father’s House: Africa in the Philosophy of Culture.” He is also co-editor, with Henry Louis Gates Jr., of “Africana: The Encyclopedia of the African and African-American Experience,” a revised version of which is due to be published by Oxford University Press in March. Just as he likes to write for a variety of readers, Appiah said he enjoys teaching students at all academic levels, from freshmen to doctoral candidates. Since joining the Princeton faculty in 2002, he has taught courses on individuality as an ideal, metaphysics and epistemology, political philosophy and philosophical problems of race and racism. Appiah came to Princeton from Harvard, where he had been on the faculty since 1991. He also has held positions at Duke, Cornell and Yale universities. He received his bachelor’s, master’s and doctoral degrees from Cambridge University. In an interview with the Princeton Weekly Bulletin, Appiah discussed his new book, his role as a writer and teacher, and the meaning of an ethical life. 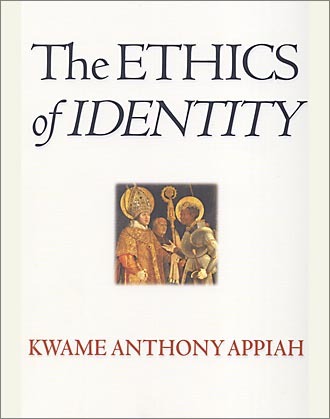 Professor Appiah will read from his latest book, “The Ethics of Identity,” at 7 p.m. Monday, Feb. 21, at the Princeton University Store. In a world with so many wants and so much suffering, how can we strike a balance between the needs of our own individuality and our responsibilities toward others? There are certain basic resources to which every human being is entitled, in virtue, in part, of their dignity as persons. They are the resources that each person needs to make a dignified life, to pursue the individuality to which we are all entitled. We owe it to each other to make sure that everyone on the planet has these basic resources, and we are clearly far from having achieved that. Until we do, there is, I think, a moral stain on the achievements of each of us who has been granted those resources and more. Part of the reason we do so much less about this than we should, I think, is the power of national and more local identities to blind us to the significance of the suffering of strangers. So identity has a dark side. But another part of the answer is that the solution isn’t really to be found in individual acts but in a systematic restructuring of the global community, which is something that can only be achieved by politics, by acting in communities. Faced with the great number of people in the world whose lives I could lift above the baseline, I feel powerless. What’s the point, I think, of my drop in the ocean? Of course the answer is, “One life is significantly aided,” but it’s hard to focus on this. If we act together, however, to reform national foreign policy and aid and trade policy, and to work with the large international NGOs  CARE, Oxfam, Save the Children, Amnesty International, Human Rights Watch  then we can hope for large-scale substantive change. It’s a key part of my claim about individuality that living an ethically successful life requires that we do what is morally required of us to a significant degree. You say that a liberal attitude should involve tolerance and open-mindedness. Do you think these values are gaining or losing ground? I think we are committed to toleration, but not without limit. There are fundamental values we cannot step back from: respect for the individuality and the dignity of each person, for example. And again with open-mindedness, I think it’s crucial to understand that recognizing that we might be wrong and that we have much to learn from others doesn’t mean that we don’t care about the truth. It’s because we can’t be sure that we have the truth and other people are mistaken, that we need to be open to those others. My hunch is that there’s probably been a net growth of these attitudes globally over my lifetime; but there are clearly places and people who are increasingly actively illiberal in this sense. I think that it is clear that there are many so-called religious fundamentalists who lack the spirit of toleration (even though modern Western toleration was developed as a religious attitude in the first place). But there are plenty of scientifically minded Westerners who lack the kind of intellectual modesty that seems to me the most sensible response to our situation as limited, fallible knowers. Overconfidence is a widespread human failing; that’s one reason I like to teach introductory epistemology! Your conception of cosmopolitanism  being “citizens of the world”  emphasizes conversation. How do we learn to have such conversations and how do they happen? I think that, for educated people, the beginnings of conversations across boundaries of identity  whether it be national, religious or something else  come with the sort of imaginative engagement you get when you read a novel or watch a movie or attend to a work of art that speaks from some place other than your own. So I’m using the word “conversation” not only for literal talk, but also as a metaphor for engagement with the experience and ideas of others. And I stress the role of the imagination here  and the role of the sorts of encounters that are central to the humanities  because it’s crucial, I think, that these encounters be undertaken not just because they make it more likely that we can live together in peace, but because the encounters, properly conducted, are valuable in themselves. And that’s another element of the metaphor of conversation: Conversation allows us to understand others, teaches us things, but it’s also a pleasure. If you try to persuade people to engage in conversation across societies as a kind of necessary drudgery, they won’t take it up in the right spirit  they probably won’t take it up at all. So cosmopolitanism, in short, has to be defended as a delight, not as a duty. You write that each of us creates a life by “interpreting the materials that history has given us.” How have the “materials” in your life shaped you into becoming a teacher and a writer, among many other things? I think that teaching is central to my life for two major reasons. One is that my faith as a humanist is that the things we study are worthy objects of human attention and that part of what is most worthwhile in our civilizations is that we pass on these objects  literature, the arts, philosophy  and ways of understanding them from one generation to the next. I was privileged, as so many modern people are, to have some of them made available to me through an education I enjoyed at the time and am grateful for every day. That’s why I write not just in scholarly venues but also, when I’m invited to, for that curious audience: the educated public. And the second is that through teaching I learn; I learn all the time. So it’s as much for my sake as for the sake of my students (perhaps, even, more for my sake, I don’t know!) that I teach. Trying to communicate to smart young people, who are willing to learn but who have not yet mastered these traditions, simply enriches my understanding of my subject. Every year some undergraduate asks me a question or makes a suggestion that revises my understanding. I have to say, too, that my mother  who is both a novelist and children’s writer and a painter and well-known expert on the art of Ashanti, where I grew up  raised us with a great love for literature and the arts. I write as much as anything because I enjoy writing; and I enjoy it, I am sure, in part because I grew up around books. My mother used to read the English Romantic poets to us; she encouraged us to write poetry; she wrote it herself. When I came home from school for the holidays she had put out by my bed novels that she had enjoyed and thought I would enjoy. D.H. Lawrence, Tolstoy, Chinua Achebe; but also mystery novels, and contemporary comic fiction. In other words, not all heavy canonical stuff! As for my cosmopolitanism, that I owe to my family, too. How else to explain that I have a Norwegian and a Nigerian brother-in-law, Lebanese and Kenyan cousins, except by the fact that my English and Ghanaian families (and their Norwegian and Nigerian ones) were open to the world? The college years tend to be formative ones for young adults, when questions of individuality, identity and future goals have great play. With your philosophical training and your many years of experience on college campuses, what can you say is at stake for students in these years? I’ve taught freshman seminars on these topics since I’ve been at Princeton, and they were among the most rewarding intellectual experiences of my life. The students take these questions seriously and are willing to work through difficult novels and hard philosophical texts in order to think about them. It’s one of the things that I’m proudest of in our American educational system: that we believe so passionately in the ideal of a liberal education  an education that provides you with tools for the development of your individuality, not just with preparation for a career; that requires that you have the intellectual tools to think about the choices you have to make and the knowledge to understand the natural and social worlds we live in. Having that knowledge isn’t just an instrument in making choices or in managing your life, it’s also something of great intrinsic value. Which is why I think that a good appreciation of the social and natural sciences  their methods and some of their central theories  is as crucial to the liberal education of a novelist or a lawyer as it obviously is for someone who is going to make a career in science, pure or applied. The study of ethical issues for Princeton undergraduates continues to expand, and students are required to study “ethical thought and moral values.” How much presence do you think the study of ethics should have in the undergraduate curriculum? How might students be made open to the notion of, or even prepare for, an ethical life? I would like to say two things about the role of ethics in a liberal education. One is that I don’t think teaching morality or ethics in the classroom is going to stop people from doing bad things. Every time we have the sort of moral panic brought on by the Enron fiasco and the suite of accounting and business scandals that followed, people say we should be teaching more ethics. Well, I don’t think that more moral philosophy in the business schools is going to help there. What we need are laws and regulations and effective oversight; and we need, I think, as well, a culture that respects more in business achievement than the bottom line. Because mostly when people do what’s wrong in these cases, it isn’t because they don’t know that it’s wrong. It’s simply that they are tempted by the profits and they think they can get away with it. Theory is hugely important in moral life, because when we have big choices to make, we need to be able to frame them conceptually somehow, to talk ourselves and others through them. But it’s only part of the story. To put it crudely: the Good Samaritan was responding as much with his heart as with his mind, and classrooms are not a good place to change hearts. A lot of the education of the heart that goes on in college happens outside the classroom  as people interact with people from different backgrounds in common activities, sports, clubs, working together on problem sets, discussing with friends, agonizing about love. That’s a crucial part of ethical education, too. The second thing I’d like to say, which is implicit in what I just said about a liberal education, is that preparation for an ethical life comes from every area of the curriculum, even if in different ways. An ethical life is, among other things, a life in which knowledge and understanding have a place; it’s a life in which you take your civic responsibilities seriously, which means having some sense of what’s at stake in the economic life of your society and the world. The role of those of us in the normative disciplines is not, in my judgment, to tell people what the right answers are to the ethical questions: it’s to provide them with the tools for thinking about them themselves. I have strong views about politics; but I’m not trying to persuade students of any particular policy line. I’m hoping they’ll learn something from me about how to make up their own minds.